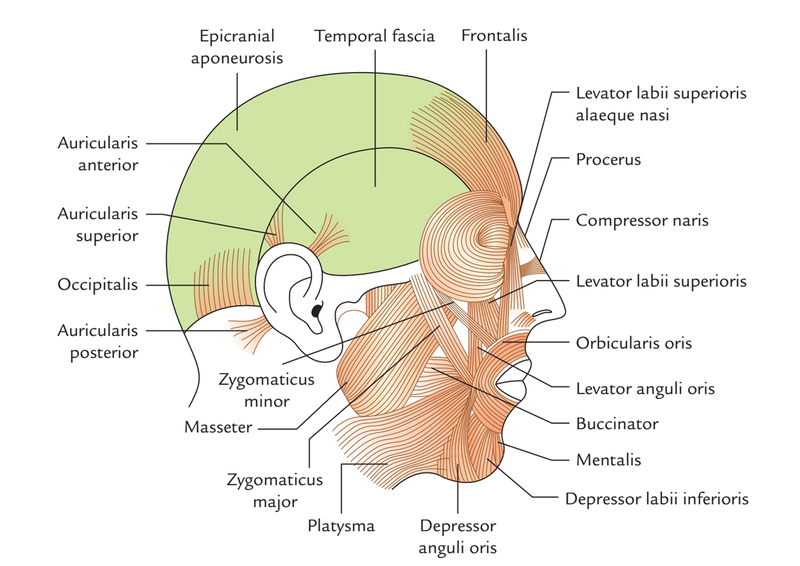 The depressor anguli oris muscle is a short, triangular muscle situated at both sides of the face in the lower jaw, anterior towards the lower jaw. The depressor anguli oris becomes activated at the time of frowning. Depressor anguli oris emerges alongside the side of the mandible below the canine, premolar as well as first molar teeth. It has a long, straight starting point via the mental tubercle of the mandible along with its extension, the oblique line, inferiorly as well as laterally towards depressor labii inferioris. Depressor anguli oris attaches within skin and around the corner of the mouth to the upper portion of the orbicularis oris. It depresses the angle of the mouth. It is a short, triangular muscle which is situated at both sides of the face. Together with orbicularis oris as well as risorius, it merges within a narrow fasciculus which combines at the angle of the mouth; and several fibres extend within levator anguli oris. Depressor anguli oris is constant inferiorly to platysma as well as cervical fasciae. A few fibres can travel inferior to the mental tubercle and traverse the midline in order to intertwine with their corresponding fellows and create transversus menti as a result. Some babies are born without this muscle on one part of their face, which makes only one part of their mouth descend whenever they make sad expression. Though, as they mature, this form becomes invisible. The inferior labial branch of the facial artery as well as the mental branch of the maxillary artery supply depressor anguli oris. The buccal and mandibular divisions of the facial nerve innervate the depressor anguli oris. Depressor anguli oris pulls the angle of the mouth inferiorly and laterally at the time of opening the mouth as well as in expressing unhappiness. At the time of opening of the mouth, the mentolabial sulcus becomes more horizontal and its central portion excavates.